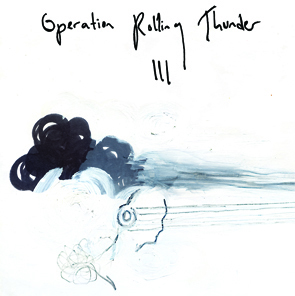 The debut album from Operation Rolling Thunder is a study in glorious dynamics. An instrumental two piece band featuring Invercargill-raised and Dunedin-resident brothers Rob and Adam Falconer, this album is the result of a three day recording session with Dale Cotton (High Dependency Unit) in 2007. Taking their cue from High Dependency Unit's expansive instrumentals, and adding a keen sense of urgency and pants-grabbing dynamic range, Operation Rolling Thunder sit comfortably alongside Sora Shima, Mogwai, Jakob and Kerretta in sonic experimentalism. This black vinyl album comes with a free download of the complete album.